The first table below has all of the 54 Rathbone and Bruce episodes that I currently have in my collection. They're listed by broadcast date, and there's also a broadcast script in pdf format which is great to read whilst imagining Rathbone and Bruce's voices doing the parts. The second table lists the 38 episodes starring Nigel Bruce and Tom Conway. I'm always on the lookout for more episodes, the chances of any of the missing ones showing up are slim but I hope there's at least a few hidden away in a forgotten box or attic that haven't been found yet. If and when I'm lucky enough to get any more, I'll add them to the lists. The episodes available for download below are in their original state, with all the adverts left intact. Old-time Radio episodes are in the public domain, so free from copyright. Please click on the links below to download the episodes (mp3 format). I've edited out the annoying interruptions that take up 6 minutes per episode on average from all the episodes in my possession, while keeping some of the chatter between Dr. Watson and the host for continuity. These edited episodes are available to buy on CD here, purchasers of the CD will be emailed any future episodes added to my collection. 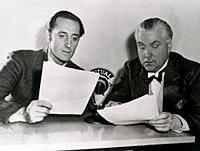 The Singular Affair of the Baconian Cipher was Rathbone's final show and he was replaced by Tom Conway for a further 38 episodes, with Nigel Bruce continuing as Dr. Watson. All the shows are listed below for download. Advert-free versions of these episodes are available to buy here.